I have combined my last 2 blogs because I think they are both important. WOW! What a great feeling to be back playing sport again. Whilst the tennis was a little rusty, my movement around the court was exactly as I had left it. I am still not 100% and still have plenty of work to do but I was astonished that not only did I feel great playing but there was no reaction, yes, no reaction whatsoever after playing. If there is a silver lining with this injury, I am fitter now (45 yrs) in terms of core fitness than I have ever been and will continue with my exercise regime. 10 min treadmill slowly increasing pace. Added weights to the above 3 eventually. Alternate each session with last 3 using the Leg Press and the Hamstring & Quads machine. Stand with step between your feet (narrow) bring left foot up, then right foot up, left foot down to floor, right foot down to floor. Now stand with the stepper on your right (narrow). Place right foot on stepper and push up so left foot is lifted then return left foot to floor. Repeat other side. on the stepper. Raise left foot from the floor behind you, over the stepper and down to the floor in front of the stepper only don’t put it on the floor. Swing left leg left and right a couple of times. Now lift the left foot back over the stepper behind you and repeat the swing just above the floor behind you completing one cycle. Repeat swapping feet over. This will be a good test of balance on your injured leg! Double heel lift on the stepper. Build up to 30 reps for each exercise. Use theraband tied to banister. Place band along the top of the foot and pull towards you, then out to both sides and finally push away from you. Eccentric double heel drops from bottom step, raise up and lower below step. I then go through a series of body stretches held for 30 seconds x 3 to improve overall flexibility. In an ideal world do each session every other day. In the real world, fit it in when you can and don’t get dispondent, you will get there in the end how ever long it takes. Slowly build up running ensuring proper warm up. When ready, start with assisted single heel raise until you can do it without assistance. My training protocol said return to sport after 26 weeks. Don’t rush it, only go back when you are ready. I waited till 36 weeks when I felt I was ready. I started this at about 15 weeks and I had the odd week where I did nothing for one reason or another. I can only talk from a non-operative perspective but I had 4 sessions of massage on the injury point and I’m not going to hold back when I say it was the most painful experience of my life but well worth it. The only way I can describe it is like someone massaging you with razor blades - sorry folks but I would rather be honest and yes like a woos, I ended up biting my own finger to bear the pain but I defy you to not do the same! After those four sessions, I went from very slight limp to normal walking. I still do massage myself on the injury site 10 mins a day when I can but it doesn’t hurt at all when I do it! Just when I thought I had covered everything in my last post, I forgot one key ingredient - Massage of the scar tissue. 8MTHS & BACK TO TENNIS!! Things are moving along nicely now. I am running quite happily on the treadmill amongst all the other physio but I still can’t put any weight on my toes, there is just nothing there. Is this normal after 17 weeks or is there something else I should be doing? I had a call from the head of physio for my local NHS trust and I quote her as saying “I share your concerns about your physio treatment”. She is going to meet with the head of Physio at my local hospital today to discuss my case. Now into week 15 and still only been given some basic foot exercises and one stretch. I am taking things into my own hands a little and have joined a gym so I can use the static bike, stepper and fast walk on treadmill building up to a gentle jog when ready. I have an aerobic step and doing some basic step exercises, heel raises and easy stretch. I start a group exercise class at the hospital tomorrow so hopefully I will be given better advice and guidance then. I feel I am having to manage my recovery on my own which doesn’t seem fair. Surely there needs to be some sort of test as to whether someone is ready to jog. I have seen protocols stating jogging only once you can jump and 6 months post injury or muscle size on injured leg no less than 10% compared to healthy leg. At this stage, I’m not convinced the NHS in the UK is equipped to deal with the physio recovery side of this injury but happy to be proved wrong. Now, I am getting a little concerned. I am in week 14 and have still only been given a couple of foot mobility exercises and 1 stretch (towel pulling foot towards head and hold for 20 seconds). This doesn’t seem to be in line with the usual protocol. The first time I saw a physio was with a physio and a trainee. Now i am in the hands of the trainee only. I have run for a minute on a treadmill and have been told I can resume jogging! Whilst I feel I can probably jog and it sounds great, I am not convinced I am ready, or, am I just being over cautious. 4 weeks ago I am told by a consultant the next 4 months are the most vulnerable to re-rupture. 4 weeks later after wiggling my foot a bit I am told I can go jogging. I have rung the hospital and asked if I can just run that past a consultant to see what they say. So waiting for a call back fingers crossed. This may help those who have not had surgery. My achilles went without any warning having just played tennis for 2 hours followed by a kick around with a football. I was advised by a surgeon not to have surgery, don’t yet know if I will live to regret that advice! I was put into a temporary cast immediately with toes pointing which was replaced after 10 days. Second cast meant I was in a cast for 3 weeks, then into the boot. Ditched crutches and FWB after 6 weeks, boot off after about 10 weeks. Was surprised how easy it was getting back on my feet and into 2 shoes. Very frustrated by lack of PT thus far, only given modest mobility exercises and towel stretch but I know I have to be patient. Can do 2 footed calf raise. My calves are screaming at me for more exercise. Back driving by week 11 and able to walk reasonable distances with slight limp but no pain with the achilles which is good. Have some pain where I can feel the bone of my heel but seems to be reducing day by day (initially, could hardly weight bear because of the pain). I have physio again on Monday so will see where that takes me. Last thing, foot still swells; I generally ignore through the day, maybe chuck some iced peas on it if I get the chance but still sleep with legs raised on pillows and when i wake up, foot looks almost normal again. Struggling with the skin underneath the foot even though I keep putting moisturiser on it, the skin gets very dry and peels. Feel under pressure from work to get back to full duties; not convinced they understand how lengthy and slow the recovery process is! Desperate to ride my bike or do sport but again I know I have to wait. Will try and update again. Yesterday was day 74 and I went for my first long walk with my wife. It was lovely, almost felt normal but still a long way to go. Have a slight limp, not from pain, I think it is just muscle weakness. I have only been given 4 exercises to do but I’m doing my own pilates every day although nothing that would affect my lower leg. I’ve had the conservative treatment so no operation. Just hope it turns out to be the right decision in the long term! Thanks Phil…I do get massage and I do self massage also…I am now also using a compounding cream the OS prescribed made specifically for me…it is applied right on the tendon and on the ingredients is to help break up scar tissue. I’ve been using it 3 times a day for over a week with mixed results. For me massage has been helpful so I’m glad you brought it up to bring it to others attention. I know I did early massage at 6 - 12 weeks on my own after receiving tutoring on how by my PT…. (very basic applying pressure to the scar tissue point by point along the tendon) and my PT started around 10 - 12 weeks with more aggresive cross friction etc…however, massage is a tricky thing with an injury and I’d recommend to blog readers not doing it without a experts help. There are YouTubes on correct massage technique for Achilles tendon ruptures if you are curious or very confident in your ability to manage yourself. see my next update on massage, that might be what you need! I am pretty sure it was roughly 16-20 weeks in. I went to Physio and that was all they did. At what point of your recovery did you begin the massage therapy? Thanks for posting your workout routine Phil, looks like you have been working hard. Being fitter is a fantastic outcome of ATR, it is an injury that makes us take stock of our physical health and appreciate our fitness for sure. Thanks so much for the update!…at 19 weeks now I always get excited when someone ahead of me posts. I’ve observed that it is the tendency as time goes on to post less and less, obviously because there isn’t as much to post about and we do get busy living life again….So thanks. Putting up your program was great because I can see I’ve done exactly everything you have except running and it’s reassuring to know we’ve rehabbed in the same way and your playing tennis at 8 months…YAY! I especially liked that you said this: “here was no reaction, yes, no reaction whatsoever after playing.”….because I am still having tenderness along the repair site and most definitely have a reaction letting me know it’s there. Donna, see my next update on massage, that might be what you need! Keep up the double leg stuff Phil, I am sure you just need to get stronger. Good for you- running! You can also lean on a counter to take some weight off your feet. BTW, 2 good new-blog settings: (1) Activate AJAX Editing, and (2) Install the ATR Timeline Widget. 1 in Settings, 2 on the Main Page. The gentlest exercise, apart from gentle seated Theraband or towel (belt, rope) work, is 2-leg heel raises. At first, put most (or all) weight on the strong side, then gradually shift over as tolerated. A diy Alter-G or swimming pool! Phil - I started single heel raise around 14 weeks but before then I would go up on my good leg and come down slowly on the bad, adding more weight as tolerated. Some people never get there and some take a bit longer. 17 weeks is still early and your strength may develop as you work the muscles. One thing that could prevent it is healing long. This does occur frequently with this injury and the amount of strength loss will vary. It is a matter of working on your strength for the next year and then a review. If you have healed long then you can live with it or undergo surgery to shorten it. Many who have healed long can live with it fine. This is the worse case scenario and it could be you are just needing more time. I suspect I am have healed a little short after surgery and that can pose other problems but could account for the full height heel raise and strength early. I am glad you are doing well! I am at 7 weeks so can’t answer I’m afraid but am looking to hearing the replies for sure! As anyone in the UK knows, the NHS is organised into healthcare trusts, each responsible for allotted geographical areas and managed teams with vastly different priorities and capability. 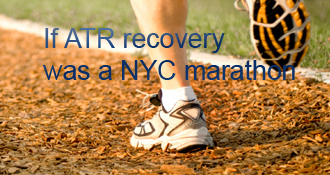 For this reason, and atr treatment and rehab is a good example, standards and protocols vary considerably. In some cases, you can reach 15 weeks or more with no physiotherapy offered, or you can be in the hands of a physio from week 2 or 3. I am talking NHS and in my case I met with the consultant for diagnosis, we agreed on non-op treatment, and from then on I never saw him, although he and his senior colleagues were always available if the physio needed their opinion. I did see the physio once every 2 weeks to week 9 or 10, then NHS physios in cottage hospitals near my place of work. I know what you are saying - I got NO physio from the NHS what so ever, as seemingly I didn’t require it!!!!! Needless to say I knew and needed to go that extra mile so I went privately to a fantastic sports physio who has me back to almost pre injury fitness/mobility/strength. Phsyio certainly helps get you on track to a great recovery, good luck and hope it all gets sorted. Stuart - thanks for your input about the guideline of when we could start jogging. I’m at 16 weeks now and have been doing LIGHT jogging for the past two weeks and have not had any issues at all. I can walk on my tip toes and can do 15+ single leg calf raises but yet I am unable to have my foot 4 inches from the wall AND have my knees touch. Right now, I am able to touch my knees when my foot is about two inches away. My PT and OS told me once I can walk on my tip toes (without a limp), I could start jogging, never once mentioned the +10 guideline. I have no issues with push-off and covered three miles of jogging distance today (alternating a 1 mile jog with two minutes of walking). I am concerned that maybe I am rushing things a bit since I don’t quite have the flexibility and am scared to develop other issues as a result (I’ve had plantar fasciitis and that was not fun at all). I’m going to continue to work on my flexibility and get my foot 4 inches away from that wall! In the meantime, I will continue to work on my slow jogs but won’t go beyond what I am doing right now for distance. Thanks again for your guideline. Stuart has a good point. The other thing I think you may be lacking so early on (I know I was) - the push-off. One of the things he had me doing was walking lunges, going up on my toe on forward foot on step-through. To do this with perfect form is very difficult. Once my form was good he added a 10lb kettlebell in each hand. That built strength and muscle memory really quickly. In the first few weeks he had me doing presses on a machine with toes only - dorsiflex/stretch 5 seconds then plantarflex 5 seconds to move the weight. Really hurt the first few weeks but was very effective and progress was evident. Just remembered what my physio said about jogging. The ROM is important. She said to stand in front of a wall and put your knee on it. Move your foot back, keeping it flat and straight. Your other leg can be straight back. (like you are trying to push the wall over) Your toes needs to be 10cm (4 inches) from the wall before jogging should start. That is called +10. Less than that and you are going to stress the tendon and lots of other tendons surrounding including your planta fascia. If you put your toes on the wall and try to bend you knee to the wall and can’t touch it then you are in the negative. I hope I have explained it well enough. Just saw this but responded to your post on the other page before I did so you can go there to read it. Reading Snafu’s problems and others in the UK I still think the NHS is a bit of a hit and miss. Good luck with the system. Phil, most of your aches and concerns are very common to this rehab, with or without surgery — messy skin underfoot, sensitivity under the foot and especially the heel, swelling esp. at day’s end, lingering limp esp. at day’s end, etc. You don’t say just how long it’s been since you started rehab (immobilization), which would affect some answers. If you can install the ATR Timeline Widget (instructions linked from the Main Page) it will answer our FAQs, including that one. I started bicycling (urban) while I was still FWB in a boot (pre-8-weeks), as soon as I thought I’d be OK landing on the boot with my weight (and the bike’s) in an emergency stop. And I continued in 2 shoes, though I “weaned” off the boot gradually when doing scary things, including biking. That sounds lovely! So I’m guessing you are in 2 shoes now - how long were in in a cast/boot for? yobogono’s AchillesBlog is proudly powered by WordPress and WPDesigner..